Successfully Added Mobile DVB-T Digital TV Receiver - Car AV Accessory to your Shopping Cart. 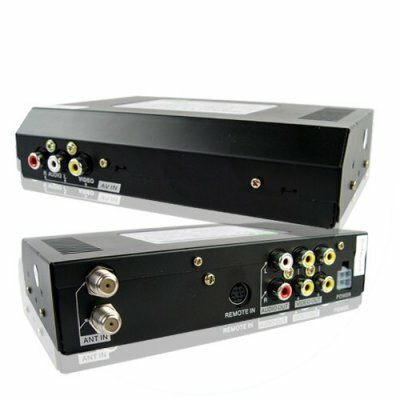 In car audio and video receiver box for turning a car into a mobile DVB-T digital TV entertainment center. With 4 Video OUT connections you can hook up to 4 different monitors in your car for simultaneous 16:9 widescreen viewing of free DVB-TV channels, and with other such features as 2 antenna IN with 2 included UHF/VHF antennas, AV IN, EPG electronic program guides, and compatibility with SDTV reception for ultra clear pictures, there is no end to the possibilities this small little receiver box can afford you. Purchase your the CVEYH-2008 at the lowest price available, and don't forget to order in bulk for extra low wholesale savings in both unit price and shipping price. Note: DVB-T digital TV reception is not available in every country. Please make sure your region uses the DVB-T digital TV standard before ordering this product.